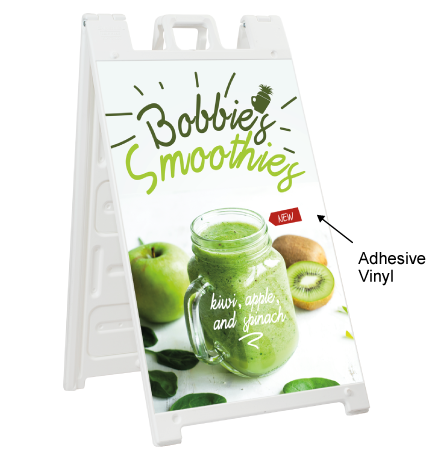 Whether you’re holding a new promotion or trying to get your customers through your door, A-Frame signs (also known as sidewalk signs or sandwich boards) are the best way to promote on sidewalks. 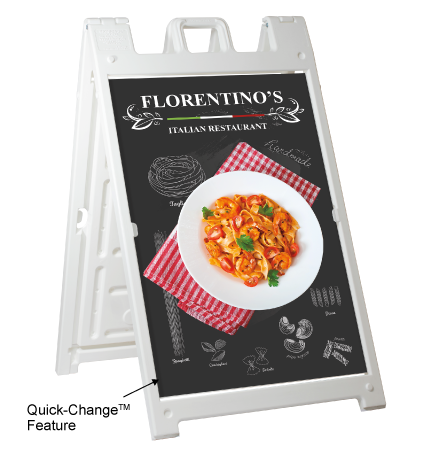 These durable signs are portable and easy to assemble right by your storefront and make a great tool for retail stores, restaurants, coffee shops and more. 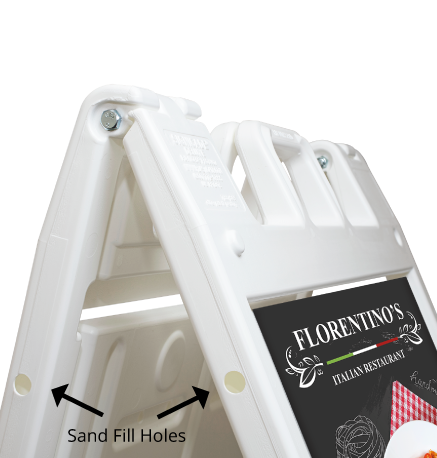 All of our sandwich boards are plastic frames, which are the industry standard for plastic A-Frame Signs. 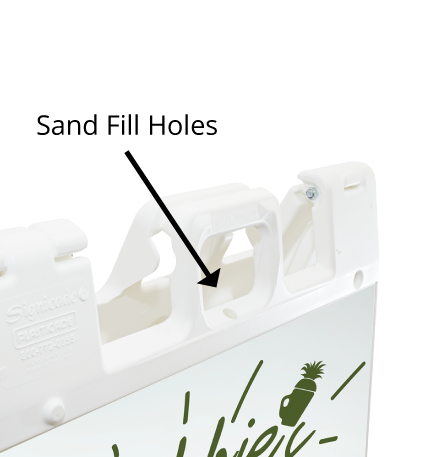 We offer two options: Deluxe A-Frame Signs have a bigger overall built with your choice of 1 or 2 Corrugated Plastic signs secured by Stay Tabs™. In addition, we offer the Standard A-Frame Signs, with a small built, which allow you to affix adhesive vinyls on the surface of the frames. We will ship custom printed, full-color 24″ x 36″ signs (you may choose to only print 1 sign to affix to the front of your A-Frame only). 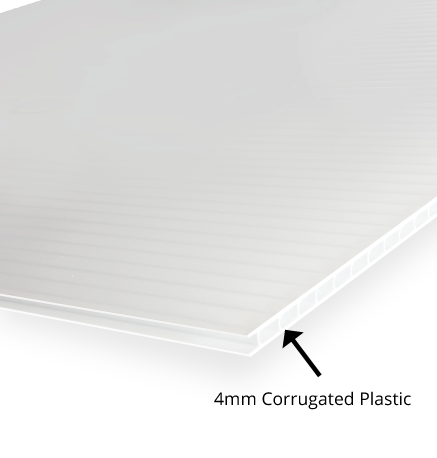 The frames are 100% plastic, are very durable, and won’t rust, splinter or fade. Our A-Frame Signs are built to endure any weather condition and meant for both short-term and long-term usage. The molded handle ensures easy portability. For all frames, molded-in stacking lugs nest into each other to ensure that when stacking the frames, they do not slide or shift. Hinges lock in the open position. If you choose to change your promotion, you can easily order the signs without the frames if you please. 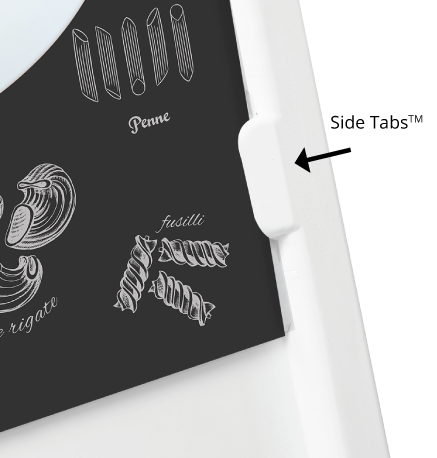 If you choose to change the signs in the future, our Deluxe frames have a Quick-Change™ feature to allow you to quickly change your custom signs in a matter of seconds. 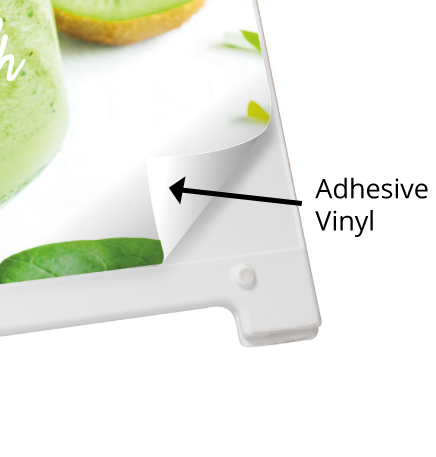 In addition, the Deluxe frames have a recessed channel within the frame, as well as Stay Tabs™ on the sides of the frame to hold your signs in place. When changing the Deluxe A-Frame Signs, simply slide in the sign into the recessed section, making sure the sign is underneath the front tabs. There’s no need for velcro, tape, screws or any other tool to change your promotion!